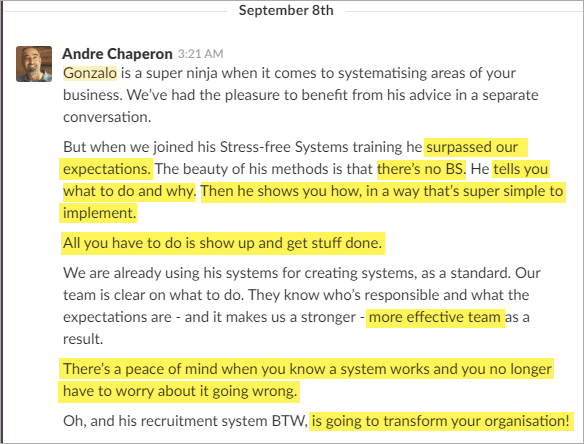 What If You Could Systemize Your Business In The Next 30 Days? Stress-Free Systems is a 4 week "classroom" version of my private systems coaching - designed to take you from being your company’s most valuable employee (aka slave to your business), to a business that runs like a well-oiled machine. By documenting and systemizing the procedures for running your company, you can create freedom from the day-to-day grind. And the best part is you don't even have to do it yourself! Identify what to systemize first so you see an immediate impact in your business… more time and more money. Create systems overnight. And the best part is you don't even have to do it yourself. I stand by this course with a 100% money-back guarantee. I’ve done everything in my power to make this the simplest systems-creation program available. 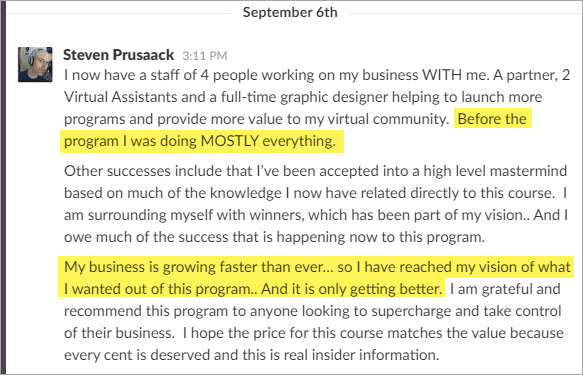 I KNOW it works because it’s the same proprietary system I’ve used for helping business owners just like you leverage their time and money with high ROI systems - creating outrageous success and freedom again… and again… and again. I know the training works, so I can take on the risk myself. 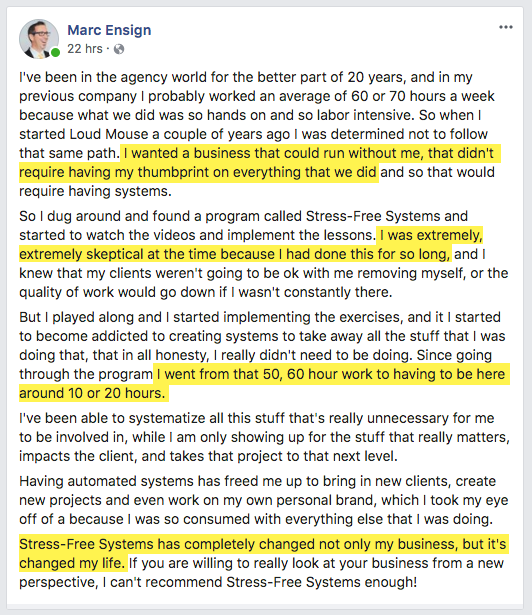 That’s why I’m giving you a FULL 60 DAYS to go through the implementation program, complete the action steps I take you through, and realize for yourself just how amazing it feels to have the systems in place that give you the freedom and profits YOU deserve. So...If you don’t double the amount of free time you have, or double your profits - I insist that you email me and ask for a FULL refund. That’s my bold promise to you, for a program that produces bold results. My training is for serious business owners and entrepreneurs only. Just keep in mind that I don't know if or when I’ll ever offer this again, and if I do, there's a good chance that the price will be significantly higher. 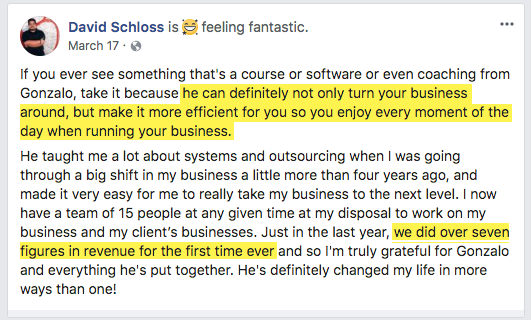 Yes, I Am Ready To Systemize My Business! If you have any questions, don’t hesitate to email me at [email protected]. Just remember, now’s the time to make a decision. So make a decision to put your business on autopilot, and I’ll see you inside the Stress-Free Systems class! This training is for people who understand why the most successful and profitable companies in the world have systems-based businesses... and want to apply those same principles in their own business. ...Stress-Free Systems is perfect for you. When a team is given a clear plan of action - with simple steps to follow, they can implement it with lightning speed. I believe simplistic proven strategies always trump complex theories. A business that functions beautifully and efficiently without you. And it doesn’t take months or years either. I realize that there are a lot of programs out there that OVERPROMISE and UNDERDELIVER. This program is not one of them. They are completely different. My outsourcing course (Outsource All-Star Automation) teaches you how to find, hire & train remote employees. 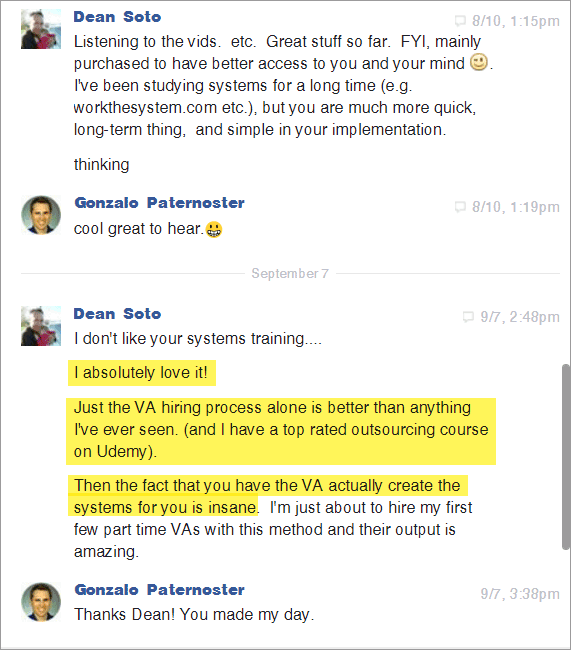 Stress-Free Systems focuses solely on creating systems (documented processes) so that anyone on your team, including a VA can follow. As a successful business owner, I know how valuable your time is. That’s why my Stress-Free Systems program only requires 2-4 hours a week of your personal time to get real results. In these trainings I share some of my own personal beliefs, strategies, and experiences that will help you accelerate your growth, and break through barriers & obstacles that get in the way of what you want to achieve. 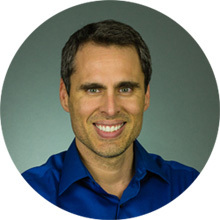 This is where you can access the video recordings of all the live lessons I teach, and any templates and resources I use. You can use them as often as you like, for as many businesses as you like. You’ll get help at every step along the way with unlimited support from myself and my team. I will select 2 lucky members of the program for a Systems Strategy Session. These sessions will be recorded so that all members can benefit from the tips, tools, strategies, and techniques I share. Because Stress-Free Systems doesn’t require the same amount of personal time and energy (one-to-one coaching), it’s easier for me to reach more people. That means and I can pass that saving on to you, and make it more affordable to participate. If you're among the many people wondering if there will ever be a lower-cost way to get my systems coaching.... but simply don't have the budget to cover the $14,000 coaching fee, I hope you'll join me for this more affordable program!